JVC Professional Video, a division of JVCKENWOOD USA Corporation, introduces the BR-DE900 ProHD decoder, a portable appliance that supports H.265 and H.264 compression standards, at the 2018 NAB Show (Booth C4315) in Las Vegas, Nev. When paired with JVC’s IP-enabled cameras, the BR-DE900 provides a bandwidth efficient, error-free streaming solution over any network, including the internet. 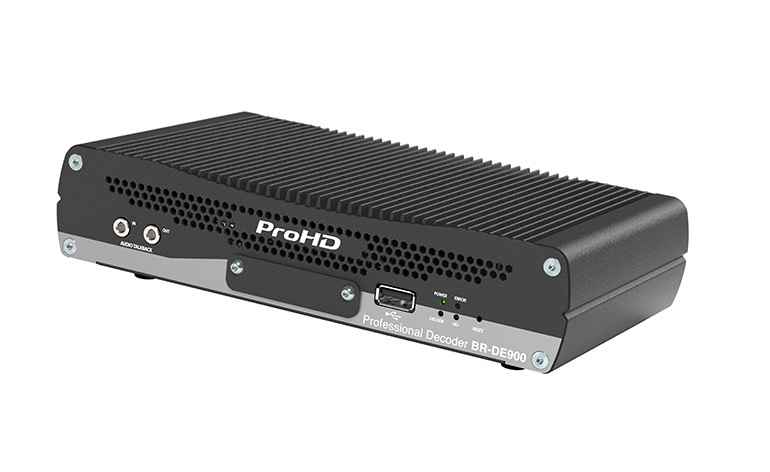 Designed for field use, the BR-DE900 provides optimal quality of service with low latency and versatile audio/video connectivity for ENG field reports and other video-over-IP applications. It offers reliable decoding of HEVC or H.264 streams up to 10-bit 4:2:2 1080p/60, with bit rates up to 50 Mbps. Connectivity options include dual 3G-SDI, HDMI 2.0, and composite outputs, as well as multiple audio outputs. When paired with the JVC BR-800 ProHD Broadcaster streaming server, the BR DE900’s efficient H.264 codec and integrated Zixi or SMPTE 2022 Pro-MPEG stream protection technologies provide broadcast-quality video anywhere in the world using public networks. Completely hardware-based decoding minimizes the decoding process cycle to minimize latency without compromising video quality. The BR-DE900 also includes integrated video scaling, frame sampling, and de-interlacing for any stream to any output resolution or frame rate, and its stream forwarding feature efficiently redistributes an incoming stream within a private LAN/WAN network. Housed in an industrial-grade aluminum case, the BR-DE900 weighs less than three pounds and includes mounting holes for seamless installation in production flypacks or master control. Setup is streamlined using an intuitive web interface. The BR-DE900, which replaces the current BR-DE800 model, has an MSRP of $2,900 and will be available in May.